Since Sexton Griffith was founded in 1990, the company focused on building homes known for their high-end quality, customization, and size. After the housing market crash in 2007-2008, the company altered their approach to homebuilding to meet their clients’ needs. They began building smaller, more efficient homes while maintaining the same level of artistry, customization, luxury, and quality—so much so that many clients relied on Sexton Griffith to build their second and third homes. Though Sexton Griffith was able to pivot to accommodate the changing housing market, their website had not followed suit. 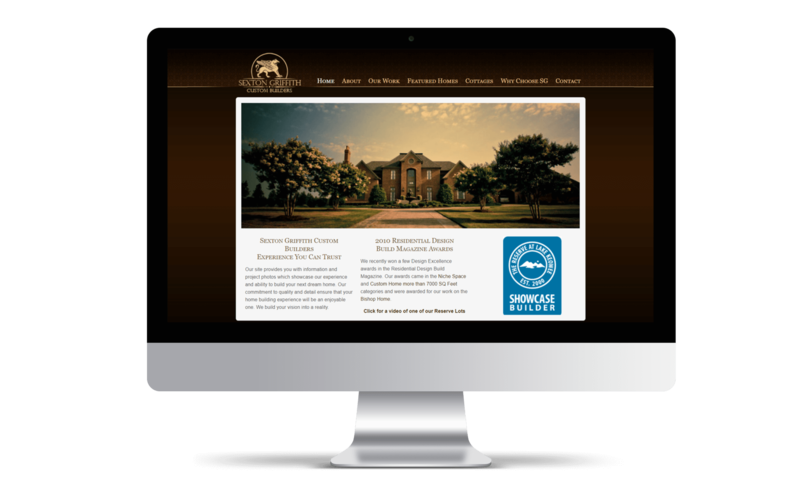 The site was outdated, did not represent Sexton Griffith’s highly personalized service, or showcase their many satisfied clients. In addition, the website appeared dark and stagnant—the very opposite of the impeccable craftsmanship seen in their homes. The company was missing an opportunity to engage prospective clients online. 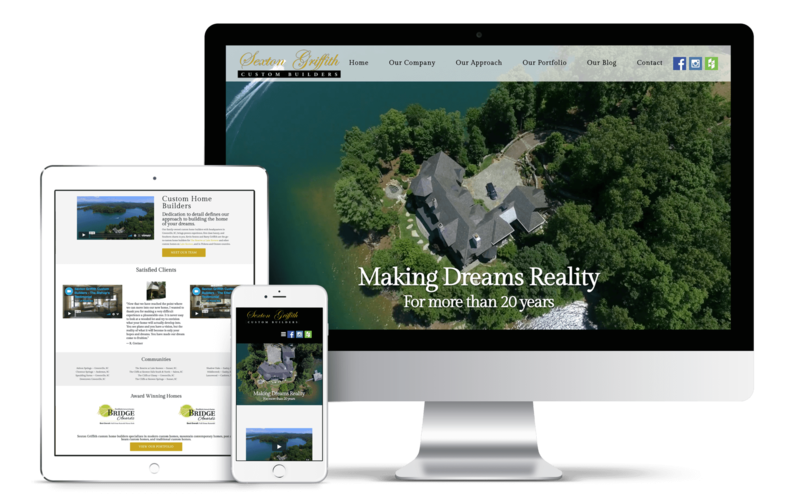 Sexton Griffith wanted a new website that would appeal to prospective homebuyers by showcasing their high-quality custom homes, outstanding customer service (and satisfied clients), and in-depth build process from architecture to interior design. Perhaps above all, Sexton Griffith wanted eye-catching visual elements on the website that lent themselves to the level of workmanship seen in all of the company’s work. Right away, we focused on incorporating more images onto the Sexton Griffith website. Given the visual nature of their industry, it only made sense to lead with images that would draw the user in. When the site launched, it featured a 3-image slider (a trend at the time) on the homepage with different elements of Sexton Griffith’s work. Later, we replaced the image slider with a custom video hero. Once Sexton Griffith’s new site launched, it was important to focus on acquiring more traffic. More specifically, the company wanted to be found more easily by serious potential customers who would inevitably be doing research online for their next home. In such a competitive industry, simply existing on the internet wasn’t getting Sexton Griffith the results they needed. The company decided to invest in a long-term strategy to appear higher in search results via ongoing SEO services with Engenius. Although their newly redesigned website followed basic SEO best practices, we spent time on the front end of this SEO campaign further optimizing Sexton Griffith’s website. These setup tasks included more advanced keyword research, setting focus keywords for specific pages, and structuring content as effectively as possible. Sexton Griffith has experienced great, steady growth in their search engine rankings over time. In addition, the number of clicks that Sexton Griffith received from search engine results increased more than 112 percent from month 7 to month 24 of their campaign.